For CCGB#104 with the caption 'Good Thinking' which made me think of Chess and my brief obsession with the game which basically amounted to learning enough to be able to beat my dad at it. 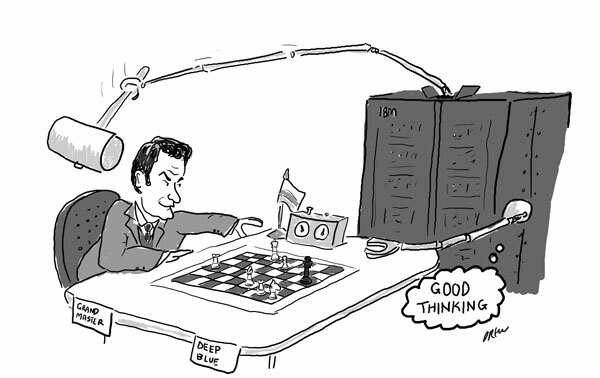 This is based loosely on Gary Kasparov's famous rematch with IBM's supercomputer Deep Blue in 1997 which the computer won. My discovery that computer's basically could beat most humans didn't lead me to believe they were intelligent just that the game of chess is ideally suited to computer algorithms where a machine can quickly work out all future permutations and select the best possible path. The subject itself was done much better by the Telegraph's Matt 'Kasparov Beats Deep Blue In One Move' (google it and see).